Second chances can be the best chances. 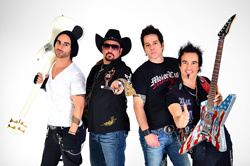 Trixter was a relatively obscure glam rock band from New Jersey appearing on the scene in the early Nineties. Despite talent and effort, the band, like many others, got crushed by emerging trends, read: grunge. Frankly, I barely remember them, except for the artwork on their first album. Trixter: cranked up and pointing. So here we are 20 years later, and Trixter has not so much evolved but matured. Here's some kickass melodic hard rock, with a bit of blues and some shuffle. I like this album. Actually, of three releases from Frontiers Records this month, this may be the best. Trixter's resurrection is New Audio Machine, a fine album of classic melodic hard rock. This should convince the naysayers and those who passed over the band back in the day (that would be me), that they have immense talent, and the ability to write some very catchy tunes. Very recommended. 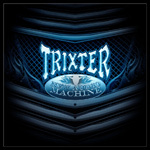 Trixter's resurrection is New Audio Machine, a fine album of classic melodic hard rock.